Most other reviewers were right. The movie is a pale comparison to 'A Few Good Men'. While the comparison of the two is natural, let me also say that the only point of comparison is the fact that both movies feature people from the armed forces and the conflict of following orders to doing what is right, doing what counts as valour. The film by itself is well made from a technical standpoint like camerawork etc but falls flat on everything else. The movie primarily fails because it does not really have a plot and what semblance of a plot does exist, seems to be a hastily put together one. The story is of two army lawyers Major Akaash Kapoor and Major Sidhanth Choudhary who are posted in Shrinagar. One has to defend a captain Javed Khan accused of killing his superior officer and the other has to prosecute the accused. There is an enigmatic brigadier (a la Jack Nicholson in few Good Men) played by Kay Kay Menon (Brigadier Pratap)who does a good job as much as possible in this failure. The two lawyers are played by Rahul Bose (Major Sidhanth) and Javed Jaffery(Major Akaash). Too much time is spent on Rahul Bose and Javed Jaffery and then Rahul Bose and Minisha Lambaa (who plays a journalist Kavya covering the story) and then again Javed Jaffery and his fiance's story etc etc and absolutely no time or depth spent on the core issue around which the movie is supposed to based. There are minor sub points like religious bias etc which come in to further dilute the plot purpose. Yes, there is this flashback when one of the witnesses recounts the tale. there is this final courtroom scene too which is supposed to be the shattering climax but once again sadly falls flat in spite of some good work by Kay Kay Menon. Minisha Lambaa is wasted and so is Kay Kay Menon. The whole Minisha Lambaa sub storyline makes absolutely no sense. 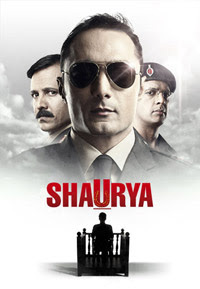 the title is misleading and Shaurya (valour) remains an oft used term All in all I have no words to express how wasted I feel this whole effort. If they had remade A Few Good Men as is, in Hindi the movie would have been far better. I only wish the filmmaker watched the new reality show Gateway on Sony Pix which is hosted by Ashok Amritraj and really gives you the basics of film making ! Charlton Heston, who potrayed Moses to perfection, won an Oscar for Ben Hur and later became the voice of the gun-toting American died at the age of 83. Charlton Heston made other cameo appearances in Tue Lies, Any Given Sunday. To me Charlton Heston was the perfect Moses on screen ever.